The small village, Padmanabhapuram originally known as Kalkulam, in Kanyakumari district was once a thriving capital of the powerful Venad Kingdom which later became popular as the erstwhile princely state of Travancore. Padmanabhapuram was not the first stronghold of the Venad rulers in the South. The nearby Valliyur, Veerakeralaeswaram (also known as Veerakeralapuram), Thiruvithamcode, Charode, Puliyoorkurichi (Udayagiri), and Eraniel still have remnants of settlements, palaces, old fortifications and major temples that predate the foundation of Padmanabhapuram. Today there is no trace of the old palace in Keralapuram and Charode, but the ruins of a palace can still be seen in Eraniel. Kalkulam was probably chosen as an apt place for constructing a palace due to its strategic location and proximity to the rugged mountain ranges of the Western Ghats which provided natural protection to the palace and the settlements. The abundance of fertile farmland and plentiful supply of water were the major attractions that invited the royals and other settlers to this region. Within the ancient Kalkulam fortification is the sprawling Padmanabhapuram Palace complex, an early administrative headquarters of the erstwhile Venad rulers. When searching for the roots of the fort and palace at Kalkulam one cannot overlook the Mudaliyar records which hint that the forts in Kalkulam and nearby Udayagiri came into existence just before 1600 A.D., during the reign of Iravi Varma Kulasekharan (r.1592-1609). John Nieuhoff, the seventeenth century Dutch traveller recorded: "Kalkulong (Kalkulam) is a very large city…being on one side strengthened by inaccessible mountains, on the other by wall, the under most of it is of stone, the uppermost of brickwork, in all 24 feet high, the royal palace stands at the west end, being surrounded by a stone wall." 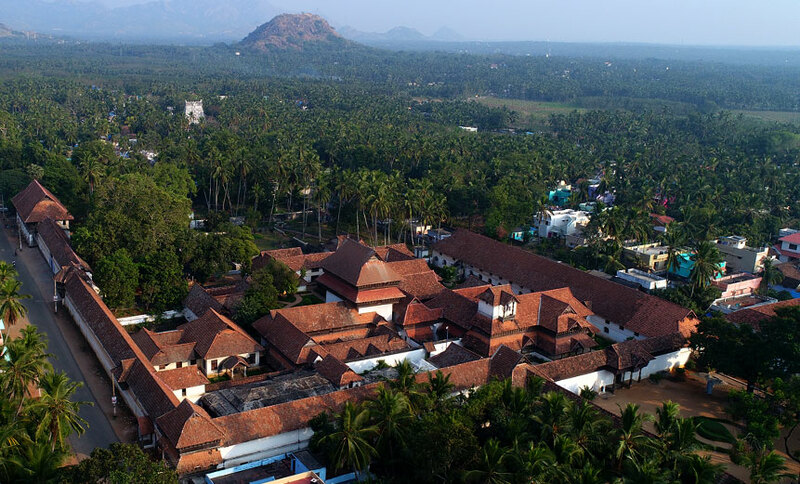 Located right in the middle of the Padmanabhapuram Fort with the Veli Hills on the East, the palace was strategically placed keeping in mind the protection offered by the hills and the abundance of fertile farmland and water. Over 400 years old, it is considered to be the largest wooden palace in all of Asia. Spread over an area of 6.5acres with over 15 edifices every bit of this magnificent complex boasts of intricate woodwork that highlights the outstanding skills of the artisans of yore. The vast palace complex of today has its core in the Kalkulathu Koikkal, a sixteenth century palace constructed by Iravi Varma Kulasekhara Perumal (r.767-784 M.E.). The palace appears in old records as Darpakulangara Koikkal and Valiya Neerazhikkara Koyikkal, its name indicating an undeniable association with a water body, the Darpakulam, that is as old as the palace itself. The palace in Kalkulam, along with the others located in Thiruvithamcode, Keralapuram, and Eraniel, was known as 'Pada Veedu', a stronghold where the Venad rulers maintained their army. John Nieuhoff, the Dutch Captain has recorded the existence of a garrison in Kalkulam, where the Venad rulers had 10,000 soldiers, to secure the region against the Nayaks of Madurai. The Mathilakam Records of Sree Padmanabhaswamy Temple in Thiruvananthapuram identifies Kalkulathu Koikkal as the permanent residence of Iravi Varma Kulasekhara Perumal (r.786-838 M.E. ), a latter ruler. The eighteenth century records from the reign of Anizham Tirunal Marthanda Varma indicate that the king was residing at Udayar vilakam, a section of the Valiya Neerazhikkara Koyikkal, while he issued the writs for the reconstruction of the old forts in Kalkulam and Puliyoorkurichi (Udayagiri). Under the orders of Marthanda Varma, the old palaces in Kalkulam were renovated and secured by a strong stone fort. Many of the structures that we see today in the palace complex were either renovated or newly constructed by Marthanda Varma, following strict principles prescribed in ancient texts dealing with Vastusastra. Once the works got complete, Marthanda Varma dedicated the palace to Sree Padmanabha Swamy, the tutelary deity of the royal family, thereafter, the ancient Kalkulathu Koikkal came to be known as 'Padmanabhapuram Kottaram'. Padmanabhapuram Palace served as a setting for many significant episodes associated with Travancore history. An important royal proclamation that abolished Mannapedi and Pulappedi was issued from Padmanabhapuram, in 1696. Around 1750 Anizham Tirunal Marthanda Varma (r.1729-1758) rebuilt the palace and the fort after which he submitted it to Sree Padmanabha Swamy, the tutelary deity of the royal family. Thereafter the old Kalkulam palace came to be known as Padmanabhapuram. After Marthanda Varma, his successor Karthika Tirunal Rama Varma (r.1758-1798) considered Padmanabhapuram as the principal royal abode. Fr. Paolino, who visited the king in 1783 states: "Padmanabhapuram is a considerable castle not far from Tiruvancoda (Thiruvithamcode), where the king resides and keeps his treasure. "Karthika Tirunal's nephew, Avittam Tirunal Balarama Varma, when he assumed charge in 1798, resided mostly in Thiruvananthapuram. In 1809, during the reign of Balarama Varma, Padmanabhapuram and Udayagiri fortifications were captured by the British soldiers who fought against the rebels led by Velu Thampi Dalawa, the Prime Minister of Travancore State. The subsequent rulers settled in Thiruvananthapuram, where a fortified settlement was established around the Padmanabhaswamy Temple. Even though Padmanabhapuram lost its grandeur with the emergence of Thiruvananthapuram, it cannot be said that the royals overlooked the ancient abode. Until the reign of Swathi Tirunal Rama Varma (b.1813-d.1846), the Navaratri festival was held at Padmanabhapuram and a vicharippukar (manager) looked after the complex. The decline of Padmanabhapuram Palace became rapid after 1839 A.D., once it ceased to be the permanent venue of the celebrated Navarathri festival. Apart from the annual Navarathri procession, the palace remained closed except for occasional visits by the royals and dignitaries. The public had no access to the complex and soon the locals came to believe that the palace was haunted! A remarkable description of the palace complex and the popular rumours were reported by artist C. Raja Raja Varma in his 'A Narrative of the Tour in Upper India.’ On November 18, 1894, Aswathi Tirunal Marthanda Varma B.A., the First Prince of Travancore, and his party consisting of artist Raja Ravi Varma, and his younger brother C. Raja Raja Varma left Thiruvananthapuram for an expedition to upper India. They reached Padmanabhapuram by evening, where they were received at the palace gates by Dewan Peishkar Thanu Pillai. Later, the party explored the ancient palace complex. "With lantern in hand, we took a ramble in the dusk of the evening, through the dark and deserted halls and the passages of this extensive pile of buildings, startling whole armies of bats, and often mistaking with a shudder our own shadows for ghosts... The simple credulous folk have often heard unearthly noises and seen strange apparitions, and dare not enter the building for any consideration after night-fall," wrote Varma. After exploring the complex, the visitors retired to sleep, "dreaming of ghosts and hobgoblins the whole night!" Thanks to Sree Chithira Tirunal Bala Rama Varma, the last Maharaja of Travancore, Sethu Parvathi Bayi, the Queen Mother, and Dewan Sir. C. P. Ramaswami Aiyer, in 1934, the ancient complex was 'rediscovered' by J. H. Cousins, the Art Advisor to Travancore Government and R. Vasudeva Poduval who headed the Archaeology Department. In 1935, with full-fledged support of the royals, the ancient palace was transformed into a museum complex. The reorganisation of the states based on linguistics severed the historic Kanyakumari District from Kerala. However, with the timely intervention, Padmanabhapuram Palace and its sprawling grounds came under the direct control of the Kerala State Government. Today, visitors come in thousands to see the palace complex - a vast pile of buildings where memories from a long forgotten age still survive.